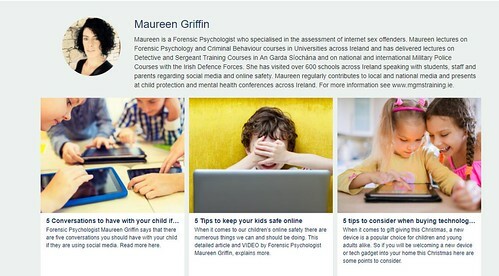 Dr. Maureen Griffin will visit Colaiste Chiarain and deliver a talk on cyber bullying. Her presentation on “Social Media- Challenge for Parents” will provide valuable information for parents. On Wednesday 18th April Dr. Maureen Griffin will visit Colaiste Chiarain and deliver a talk on cyber bullying. Her presentation on “Social Media- Challenge for Parents” will provide valuable information for parents. Dr. Griffin, B.A., M.A., P.H.D., has delivered lectures on Forensic Psychology, Criminal Behaviour and Criminalistics Courses in Universities across Ireland. She has also delivered guest lectures on Detective and Sergeant training courses in An Garda Siochana and on National and International Military Police courses with the Irish Defence forces. Maureen has visited over 700 schools across Ireland speaking to staff and students about the issue of cyber-bullying and internet and mobile safety. The talk will take place in the school from 7-8pm with time for questions at the end. As we are all aware, internet safety is an ongoing issue among young people and this is a great opportunity for parent to familiarize themselves and receive some guidance on such a complex and ever changing topic.